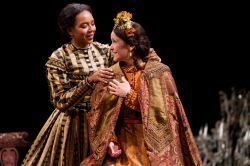 Mary T. & Lizzy K. is a production containing much emotion, turmoil and energy as the story runs feverishly through the final day of Mary Todd Lincoln’s marriage. Each actor used the stage and its spaces to the fullest, projecting their unique personalities to fill the room. The action revolves around Mary’s fractured recollections of her life the day of the fateful play at Ford’s Theater. The First Lady, well-known for her mental problems, tells us of how her relationships became fractured, through dialoging with her seamstress Lizzy. 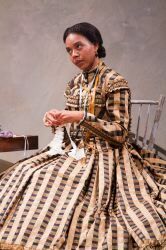 Lizzy, played by the stately Sameerah Luqmaan-Harris, is a former slave who now owns her own dressmaking business. It becomes clear very quickly that she has become a permanent fixture in Mary’s mind, an absolute mainstay for sanity. This is not just because Mary is obsessed with having new dresses, but because Lizzy’s calm composure and demeanor constantly reassures the frenetic First Lady. Meanwhile Lizzy seems ambiguous about the relationship. Luqmaan-Harris played the part with a strength and courage that was shockingly refreshing, she took charge and wouldn’t allow anyone to belittle her, at a time when blacks were still just being freed from slavery. It was entirely believable that Lizzy had been allowed to develop this strength because of Mary’s trust in her. Meanwhile, Mary is falling to loose ends. 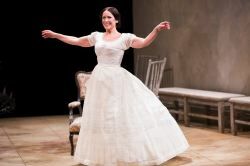 Naomi Jacobson plays the historical figure with real empathy, as a woman who needs help, but no idea what to ask for. It comes out that Lizzy is very close to giving up on her, because for some reason, the First Lady has been deferring payment on the dresses she orders be made constantly. Jacobson is a powerhouse in the role as she falls into despair over the craters she has made in her world. 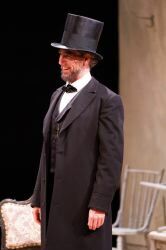 Mr. Lincoln, played by Thomas Adrian Simpson, is warm, sweet, homely and as bewildered as the audience by his wife’s problems. He plays the part with appropriate gravitas, as well as surprising lightness as a hometown bumpkin who keeps waking up every day to find he’s still the President. 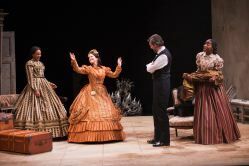 The highlight of the play comes in a moment of real tension, as Lincoln and Mary are fighting bitterly about everything and nothing. Jacobson and Simpson nearly come to blows, and just as everything becomes truly insane, they crumple to the floor together, united by their frustration and inability to communicate, and begin to laugh like an old married couple should. The part of Ivy, brought to life masterfully by Joy Jones, is vibrant in its own right as the one character in the show who is able to still separate the storms of life from the pure joy of living. She has a sad story to tell, but she uses it not to garner pity but rather to spur her on to make something of herself. Ivy has a determination to get her own back in life, and her smile and beautiful voice brings needed hope to the story. Overall, the set and costumes worked together, giving a reality to the historical setting and bringing elements of conceptual ideas to life. The space was both cluttered and sparse, with no set changes to mark time or place, and represented perfectly the mind of Mrs. Lincoln. 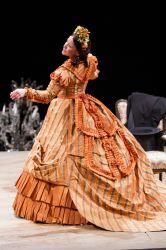 The costumes were spectacular and became a real focal point for all the mentalities of the characters. The only problems with the production came from the script itself. In a few places it tended to be a bit wordy, sounding like something between a radio drama and a book. 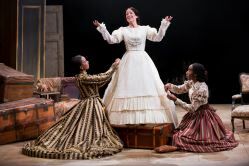 Also, the name of the play led one to believe that both Lizzy and Mary would get somewhat equal time to develop their characters, but unfortunately, the story only gave Mary’s perspective. It was hard to figure out if Lizzy had grown cold towards Mary, but had been kindly in the past, or if the “friendship” had never existed much in the first place. Most of all, due to the overemphasis on Mary’s psychosis, one was never sure if the events taking place onstage were supposed to be real, or only Mary’s perception of reality. This may have been intentional, but again, it only showed Mary’s world, and there was a missed opportunity to contrast Lizzy’s more rational perspective on the situations at hand. In totality, the play was well-directed, well acted and dynamic to the fullest. The piece was vibrant, and took a very human approach to telling the story. Each actor truly embodied their role, and brought the audience with them as they explored what it meant to live, love and lose throughout one’s lifetime. This article can be linked to as: http://showbizradio.com/go/9341.